There are many different types of turntables available nowadays. They vary in price, quality of sound, features, and designs. If you’re new to vinyl records you may be surprised to see just how many different choices you have. If you’re an old hand at vinyl you will be shocked to see all of the new styles available and the capabilities that turntables have. There are four basic categories that these turntables were evaluated: sound quality, style, value, and features. The guide below is designed to help newbies and experienced vinyl listeners alike with choosing the best turntable for their needs and preferences. We will provide you with information about important turntable specs and tell you why they are important as well as teach you what things are important to look for and what things are not as crucial. The right turntable can provide listeners with an incredible vinyl experience that will make a powerful impression on the listener. If you know anyone who loves vinyl, consider any one of the ten Crosley turntables listed, especially the top four, and give them a gift they will enjoy for years to come. 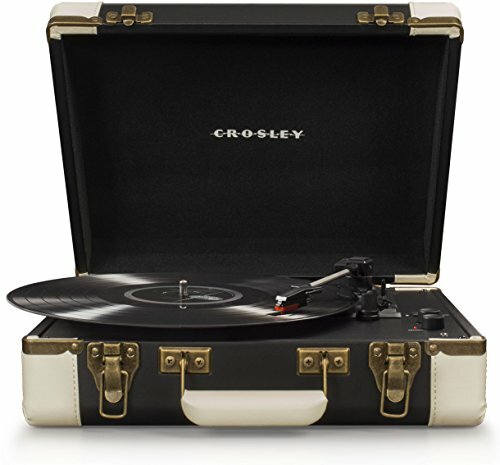 All of the top rated Crosley turntables listed above are top of the line designs that are unique and fun to have. 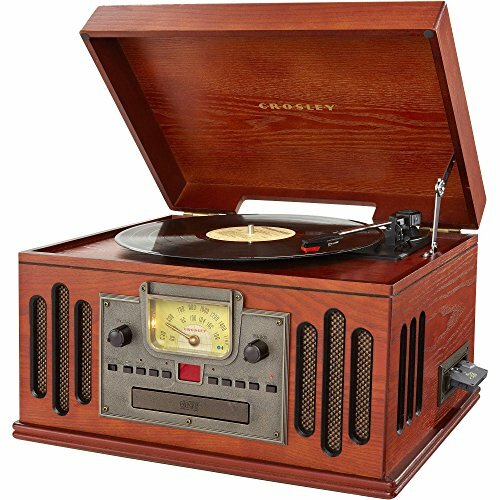 We have provided detailed reviews on the four top turntables from Crosley that are very popular with customers because of their design, quality, and features. Along with the four reviews we have put together a buying guide for you that will help you learn what you need to learn in order to sort through all of the different turntables available and choose the best one for your preferences and needs. Even though there have been many new forms of media in the market over the years, the appeal of vinyl records has not disappeared and there are still many people who are interested in this classic way of listening to music. Read the reviews we have provided and the buying guide below so you can choose the perfect Crosley turntable for your home. This attractive Crosley turntable has many features that will make it an excellent choice for those looking for a simple yet classic turntable for their home. The receiver features built-in Bluetooth that will allow users to stream music to the full-range speakers effortlessly. There are adjustable pitch control and high quality dynamic speakers to produce the best sound possible. The turntable is belt-driven and works at 3 speeds: 33 ½, 45, and 78 RPM. There are also RCA and headphone jack outputs as well. 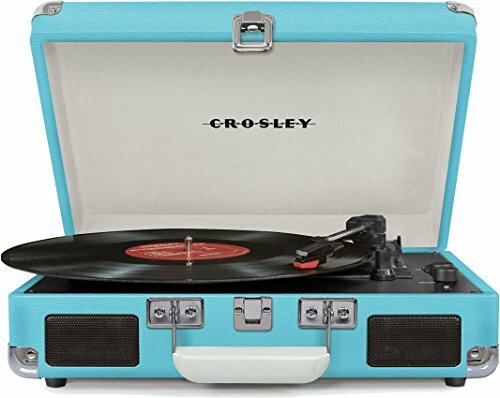 The Crosley Cruiser features a briefcase style player that offers classic style that works in any home. You can choose from a total of 12 different, vibrant color choices for your turntable and match it to any décor. If you love vintage-looking style, and love vinyl records, this Crosley 3-speed vintage turntable is a perfect fit. This beautiful turntable has built-in speakers, is Bluetooth compatible and also has a CD player, cassette deck, and AM/FM radio with a classic airplane dial. The belt-driven turntable features 3 speeds to choose from so you can play 78s, 45s, and 33 1/3 vinyl records. The full range stereo speakers offer great sound that you will truly enjoy. This turntable is audio ready and allows users to plug in their MP3 players or smartphones and listen to music that way as well. This beautiful turntable is ready to use right out of the box and features a gorgeous wood style cabinet that looks like an antique and fits perfectly in the family room, bedroom, or living room. Want to take your turntable on the go? The Crosley Executive is just what you’re looking for. Features of this sleek and easy to carry turntable include 3 speeds, built-in, full-range speakers, built-in Bluetooth and much more. Other features include adjustable pitch control, USB enabled capability so you can connect to a Mac or Windows PC. You can even turn your records into digital files as well. The sleek looking briefcase style case is available in black and white, brown and black, or red and cream. 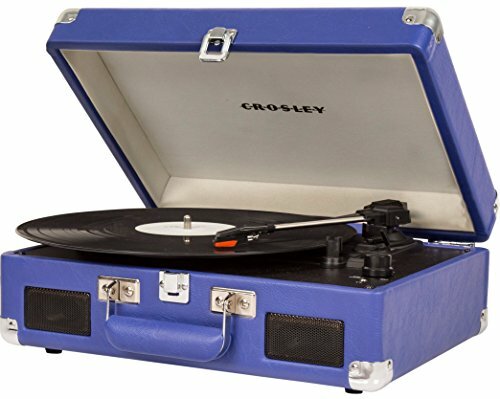 If your teenager has a love for vinyl records and things from the past they will flip over this portable battery powered Crosley turntable. Features include 3 speeds so you can play 33 1/3s, 45s, and 78s. The dynamic full range speakers produce a warm, appealing sound. There are headphone jack and RCA outputs and an auxiliary input that allows listeners to plug their MP3 players or smartphones in. This stylish turntable is bound in leatherette material that is available in ten different amazing colors in a briefcase style that looks great and makes traveling with it super simple. You can power the turntable with AC power or 6 AA batteries. The four top rated Crosley turntables reviewed above are customer favorites for quality of sound, features, color and style selections, and cost. If you are looking for the perfect turntable to listen to vinyl records, any one of these four top-rated choices will be just right. The buying guide below is designed to help you learn the features that are important in choosing a quality turntable. Crosley is a popular brand that produces a wide variety of turntables with different styles, colors and features. With the right information you will be able to sort through the large selection of turntables and choose one that will fit your needs, preferences, and style choices. Majority of turntables in America are manufactured by Crosley. There are several things that you want to think about before you purchase your turntable. We have put together the following points for you to consider so you can narrow down your choices to the turntables that fit your specific needs. These numbers come from the time is takes them to spin, also known as the revolutions per minute or RPM. Some turntables have the ability to play all three speeds and some will not so be sure to check the description to find out which speeds your turntable can handle. Most turntables automatically have the ability to play 33 1/3s and 45s so if you have a collection of 78s make sure to look for turntables that play this speed. There are some great ones out there. Variety of Features – today’s turntables are not the single function electronics that they were decades ago. Nowadays you can get turntables that have MP3 and smartphone inputs, computability with computers, Bluetooth compatibility, CD players, AM/FM radios, cassette players and a huge selection of bright colors, patterns, and styles. There are also advancements in technology that have resulted in improvements in the carbon fiber arm that won’t damage records and much more. What styles do you want? – Do you want a style that has built-in speakers or a design that has separate speakers? Units that have separate speakers tend to have better sound but if you are looking for portability, you will want to look for models that have built-ins. One of the most popular things about the Crosley turntables is that they have a lot of wood in the style which acts as a natural shock absorber and sound enhancer. Your music will sound much richer and warmer coming from a wood accented Crosley turntable. Style is up to personal preference but looking for these added benefits can enhance your vinyl record experience even more. Ease of Upkeep – Most modern turntables are pretty much maintenance-free other than replacing the needle or stylus on occasion. Crosley turntables use strong diamond needles that can handle as much as 10,000 hours of play before they need to be replaced. Another possible maintenance task you may need to do on occasion is to change the rubber belt which can become stretched out over time. Make sure you purchase a record care kit when you get your turntable to protect your records. Crosley turntables have a variety of features that they offer depending on the style and model numbers. Non-USB or USB? – One of most popular features of the new turntables is a built-in USB port. This USB port allows listeners to transfer music easily from your vinyl to your computer where it can then be turned into MP3s. This is perfect for those wanting to transfer large numbers of vinyl albums to digital files. There is some talk that the addition of a USB port is made up for by lowering the quality of the other components so your sound isn’t as good. Make sure that if the models you’re looking at have USB ports, their quality of sound hasn’t been compromised. Manual or Automatic – Most of the higher end Crosley turntables offer a manual playing system that involves you actually lifting the arm onto the record and lifting it off as the record is over. Once you do this a few times you’ll get the hang of it and not have to worry about scratching the vinyl. Automatic turntables work at the push of a button and do all the work for you, reducing the incidences of scratched vinyl. Both are good, so it is up to personal preference as to which one you like better. Some of the lower end turntables don’t have upgradeable components so if this is something that will be important to you later, make sure that the turntable you purchase can be upgraded later on. The specs of a turntable will give you an idea of the quality of your turntable. We have included the important specs below that you should look out for when researching and looking for the right turntable. Speed variation – The speed variation reports how accurately the turntable will spin the platter. Deviations in the speed of the record can affect the quality of the sound because it changes the pitch of the music. Sometimes it will cause wavering that takes away from the sound as well. Look for a speed variation of below 0.25% for the best speed variation. S/N Ratio – Depending on the manufacturer, there may be a signal-to-noise ratio or S/N. This will give you an idea of how much background noise you can expect from that particular turntable. Look for turntables with higher numbers above 65dB for the least amount of background noise. Playback Speed – Look for turntables that provide the right rotation speed for the types of records you want to play. The majority of turntables provide 45 and 33 1/3 capability but you will want to ensure that the turntable can handle that speed. Another way to get better sound is to get a stylus that is designed for the grooves of 78s which are wider than the other types. Adjustable Tonearm – Look for tonearms that have the ability to be adjusted for a range of cartridges. Also look for a carefully balanced platter that has improved bearings for a quieter rotation. A higher end stylus and cartridge can also get better sound from your vinyl while taking care of it better as well. Depending on the model, you may be able to replace the platter with a sturdier one for better sound. With a higher-end tonearm your turntable will be able to handle a higher quality cartridge which will make a big difference in the sound your turntable produces. The purpose of this buying guide was to provide you with the different features and specs you want to look for when doing research on the different models available. With this knowledge you will be able to understand what you are reading and how that transfers into sound quality and turntable quality as well. We’ve provided you with reviews for four popular Crosley turntables that have plenty of features, excellent quality, and a variety of beautiful designs that will go with any décor. With this newly acquired knowledge you will be able to sort through all the choices and choose the Crosley turntable that fits your specific needs and preferences. Don’t forget to do your due diligence and read the descriptions of each turntable you are interested in so you know exactly what it offers. You don’t have to purchase an antique turntable to enjoy playing your vinyl. There are plenty of modern turntables that Crosley offers that will fit everyone’s preferences.